Hi friends! I hope all is well with you. Murphy is all better and sleeping his usual 10 or 11 hour nights again. Thank you for your well wishes and concern. He recovered right after my last post. 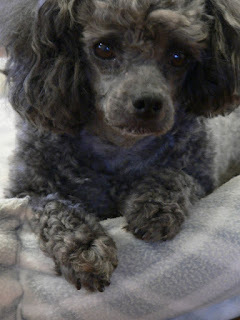 He had zero internal parasites, so I am quite sure it was the Slim Jim that did not go well with his tummy. No more spicy food for Murphy ever! Here is a picture of the progress I have made on A Wish For You. The solution I came up with for the very large house, that I want to be white like my grandparent's home, is to stitch the first part of each cross stitch (this part //// ) DMC B5200. 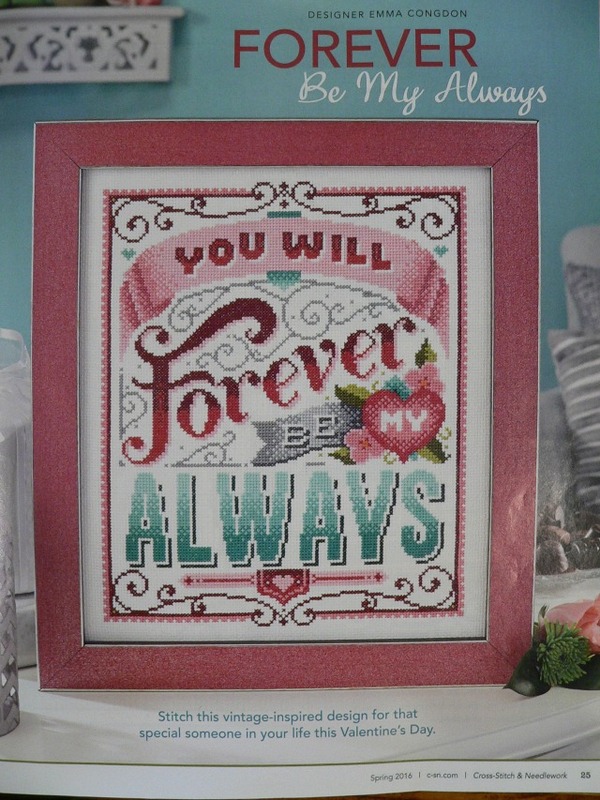 Then I am going over each of those with this part \\\\ using VMSS Baby Pink and White. This is giving me a very pale pink house. I like it.😍 How many of you guessed I would be stitching the house in pink?! tee hee The two greens I am using are DMC 522 and 320. I barely got their names to fit. Yikes! 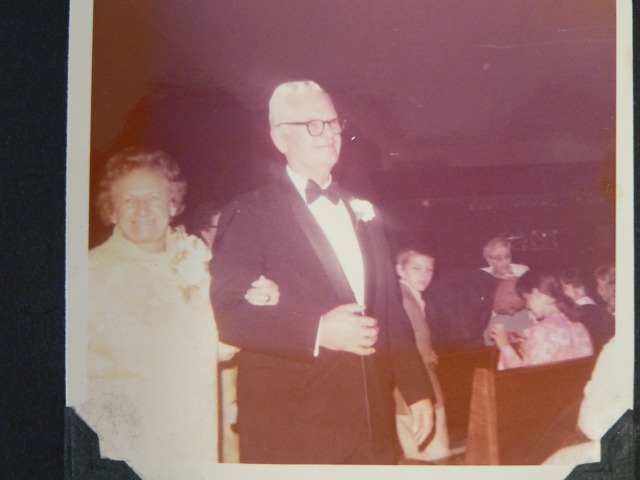 Here are my Grandma and Grandpa Kehoe at one of their daughter's weddings (my Auntie Kathy). I finished reading In Farleigh Field: A Novel of World War II by Rhys Bowen. I liked this book very much. I knew nothing about M 15 Secret Intellegence Service for the United Kingdom, and there is a bit of that in this book. 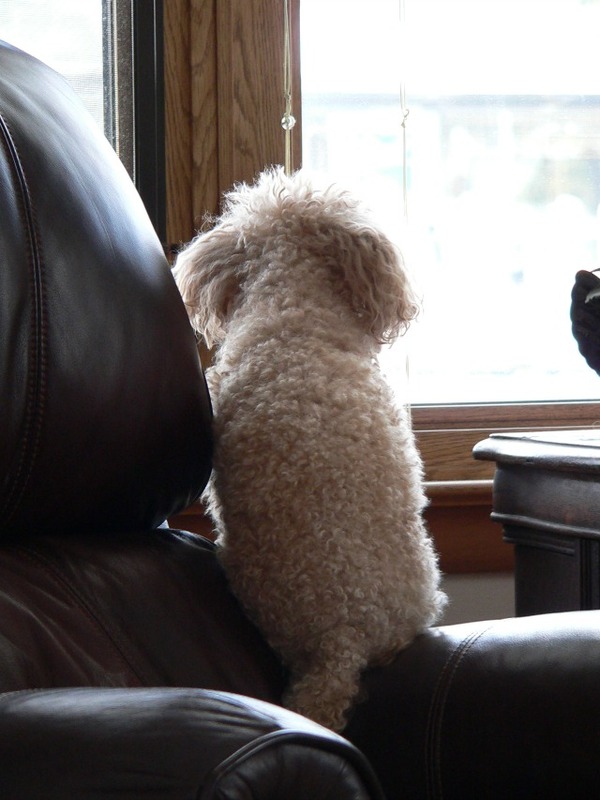 Thank you for stopping by today my friends. I am so glad you did. I welcome my new friends! I wish you all a splendid weekend! 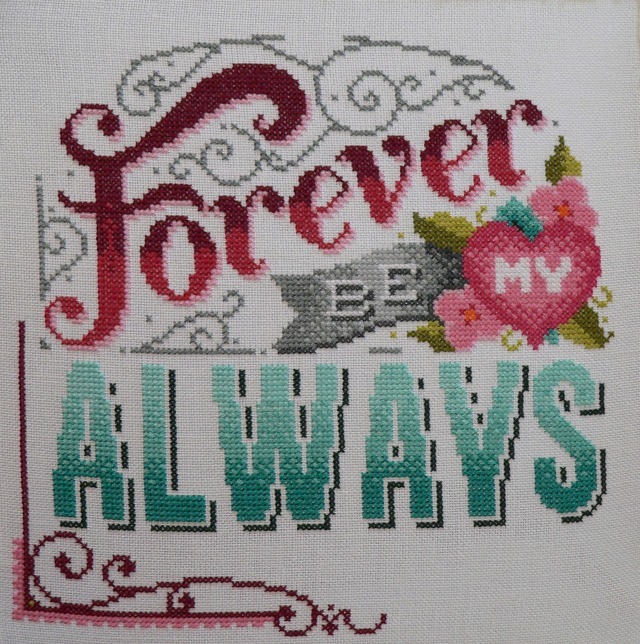 I took another picture of the Forever Be My Always pattern picture from the Cross Stitch and Needlework magazine for you. It has been a long time since I have shown you this. Some of you thought I was almost done. I have a ways to go yet. This will get pulled out and worked on again late in April. 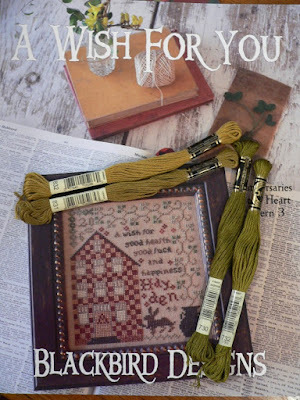 I am working on A Wish For You. I am dedicating this block to my Grandma and Grandpa Kehoe. Here is a picture of the pattern with the 4 different choices of DMC recommended to stitch up the shamrocks in the border. Now do any of those look like the correct color to you? 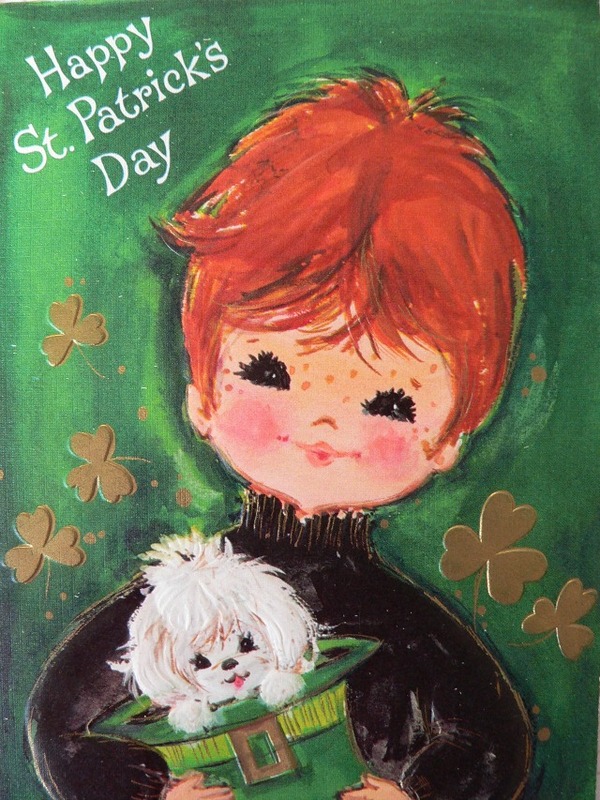 It is probably hard to see, but the shamrocks are more of the kelly green color. I just went through my DMC til I found two that matched the cover photo to my liking. 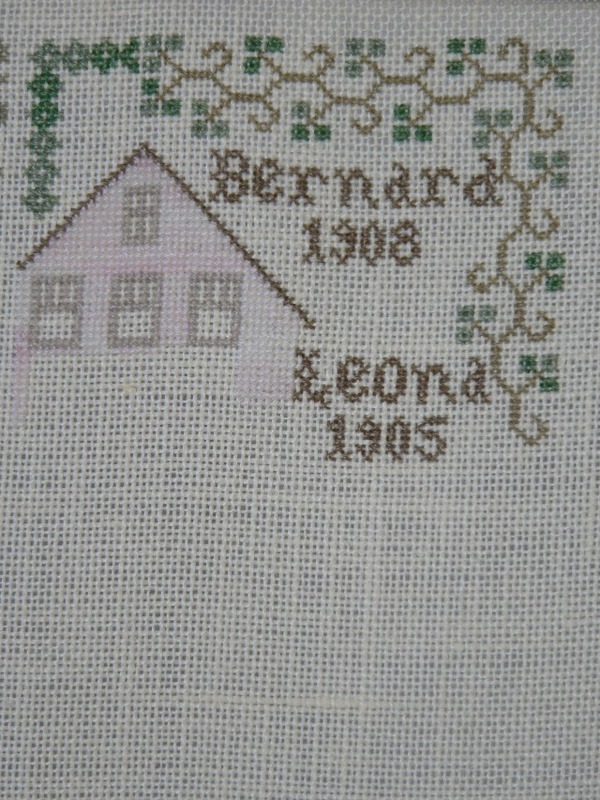 The next HUGE change to this sampler is the house. I actually started stitching it with the dark red for the bricks. I had to stop. It bothered me way too much. You see, my Grandma and Grandpa's house is still there in West Allis. It unfortunately left the family in the 1980's, but it has ALWAYS and is STILL a white sided house. 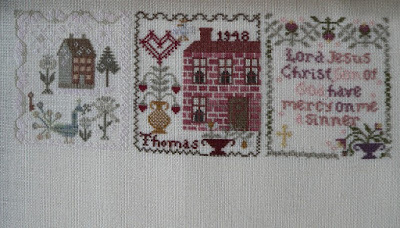 Now I know all of these homes in each sampler of this AotH series are not necessarily representative of our families' homes. But this big,dramatic brick house was just too different. 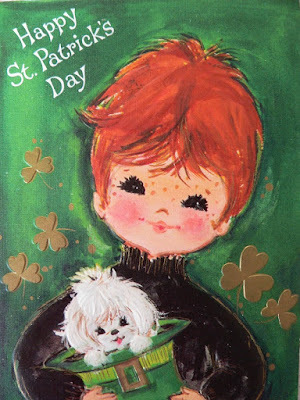 And I want this block to be for Grandma and Grandpa Kehoe with the Irish shamrocks. Soooo.. I pulled out the dark red stitches. 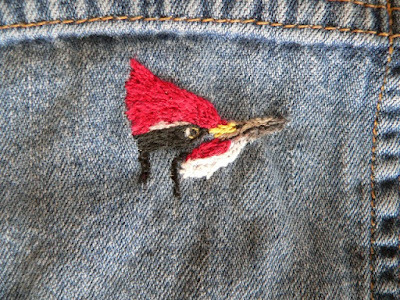 I stitched B5200 for a bit. I do not believe this is going to work. 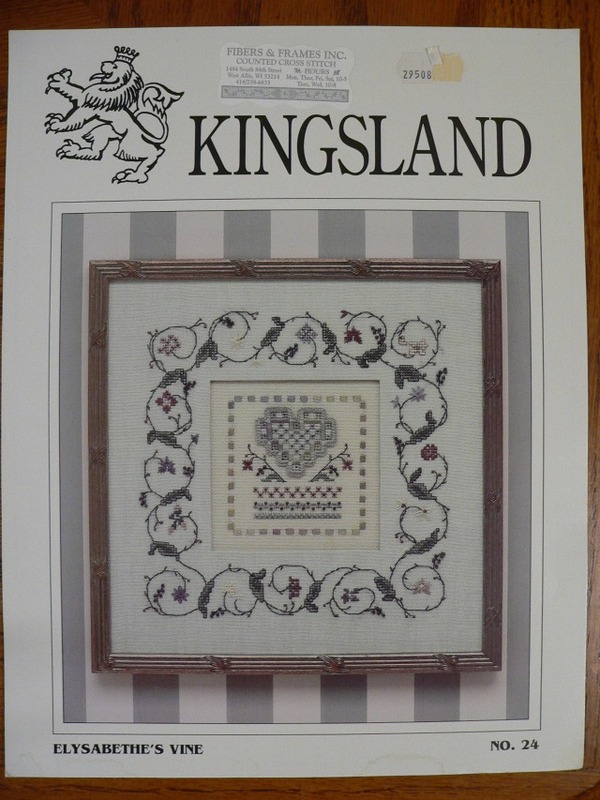 It is just too light on cream Dublin linen. 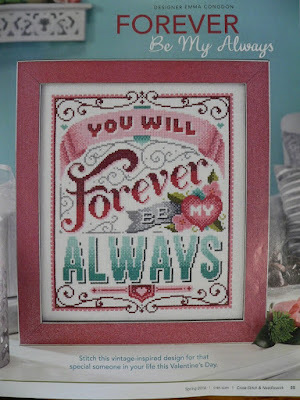 So I will be pulling out these stitches now and figuring out the correct color floss to use. 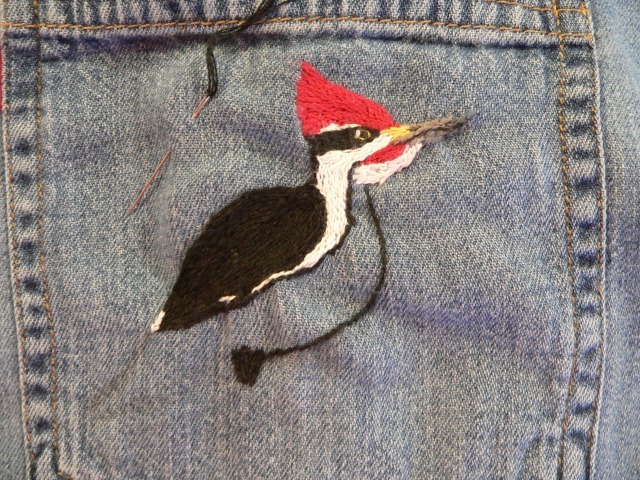 Here is where Emerson is now on his woodpecker embroidery. 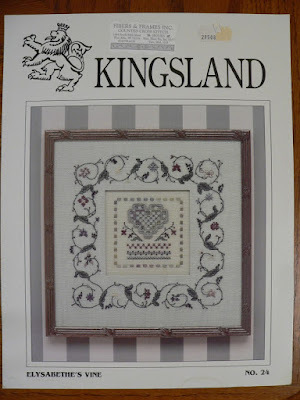 Here is the chart I am giving away. I am sorry, but due to postage, you must live in America to enter this giveaway. You must also be a follower of mine and leave a comment on this post. I will announce the winner on Monday, April 3rd. That's all for me today my friends. I will have a picture of A Wish For You on Friday. I hope you have a great week! Hi friends! 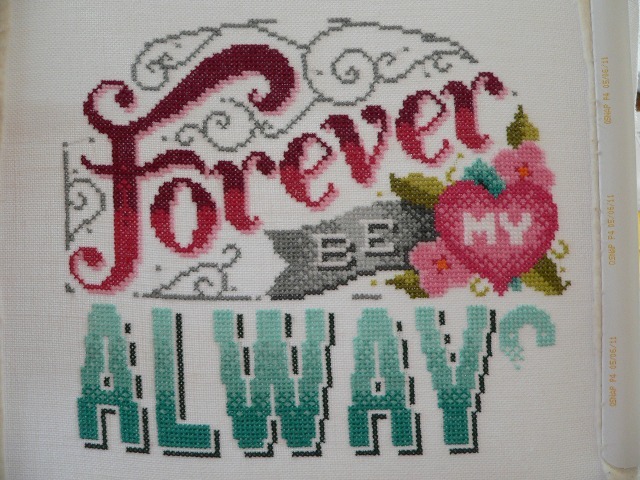 Here is an update photo on how far I have gotten on Forever Be My Always by Emma Congdon. 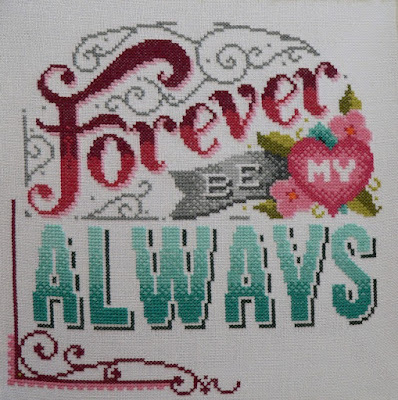 I now have this tucked away, and have pulled out the next sampler chart by Blackbird Designs in the Anniversaries of the Heart series, which is A Wish For You. This one I am dedicating to my mom. I have been having fun (yeah right!) finding correct colors for the flosses, since many of them do not look anything like the ones on the cover photo. Also I am once again changing things just a bit. 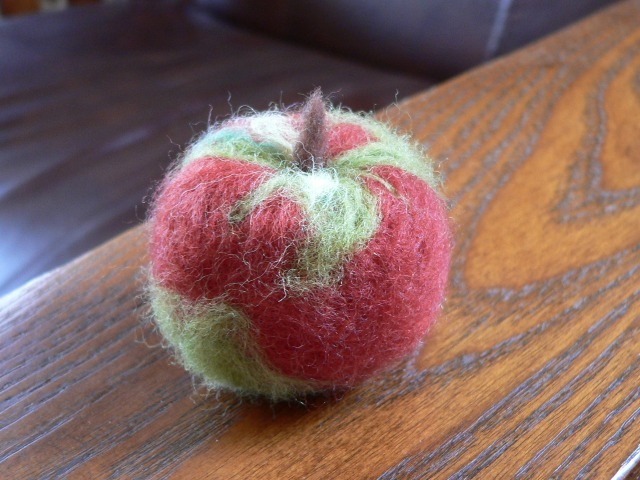 Madeleine came home a few days ago from her university art class with a needle felted McIntosh apple she made me. 😊 This is my favorite kind of apple. 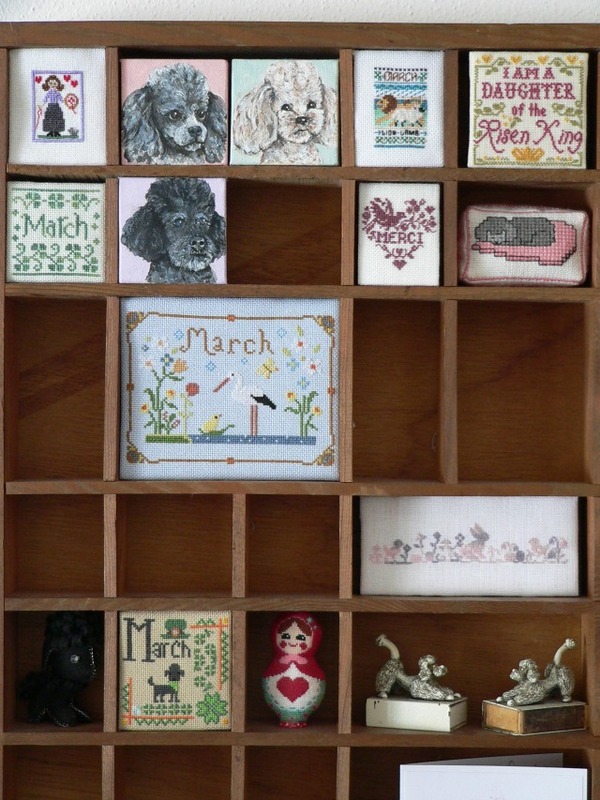 I have been looking through my stash and found some charts to giveaway. I will have one to giveaway next time. Well I hope this weekend is a lovely one for you. Thank you for stopping by and saying hi! Hi friends! Happy Spring! Take a look at this. In other news, I am still coughing and of course taking my antibiotics. I barely feel improvement. I am halfway through the course of antibiotics. 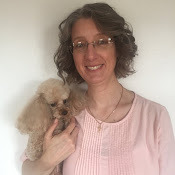 I will give it two or three days more, then give my doctor a call and ask if I should be rechecked by her for this sinus infection and the bronchitis. Maybe I will need to be on the antibiotics for a longer amount of time than 10 days. Thank you for stopping by to say hi. I hope you stay away from sick germs! 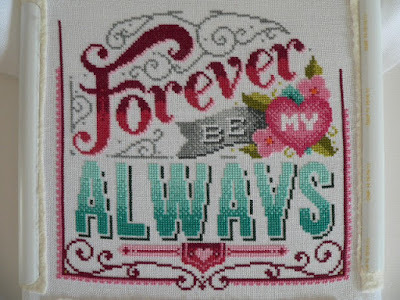 Have a stitchtastic week now! How are you? Better than me I hope! I have been coughing for almost exactly a month now. I went to a doctor last week. He said my lungs sound clear and to take an allergy pill, use over the counter nasal spray and use cough syrup. Nope. I went to my doctor on Wednesday and I have bronchitis and a sinus infection. She gave me antibiotics and told me to use the nasal spray, and I should be all fixed up. Here is a progress picture on Forever Be My Always by Emma Congdon. That is about it for me for me friends. 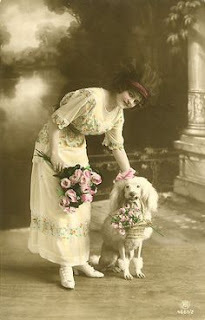 You are all so sweet with your kind comments. Thank you. Hi friends! What is the weather like by you? 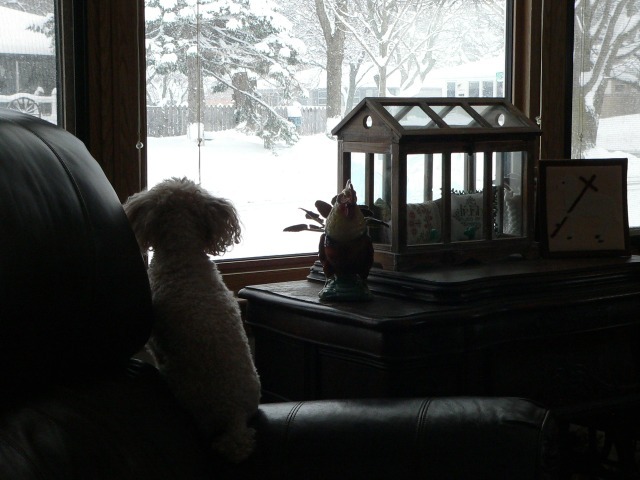 Are you having crazy amounts of snow? 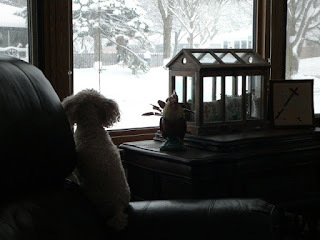 As I type this post we have 12 inches of snow now, and it is still coming down.The snow started coming last night. I tried to get a picture of the three poodles in the snow for you, NOPE! They did their business quick like. No messing around in this stuff. So here ya go. Yep. Picture that times three. ;) Looks just like them. Here are my monthly pieces on display in the cubby shelf. 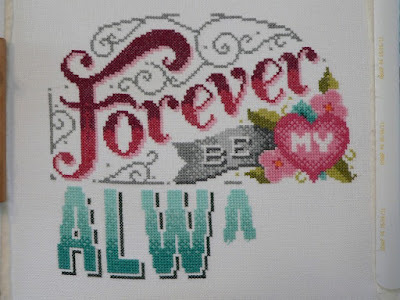 I have been working on Forever Be My Always by Emma Congdon. Here is my update photo. Brian, Madeleine and I went to an antique mall last week. The one and only thing we purchased was this. 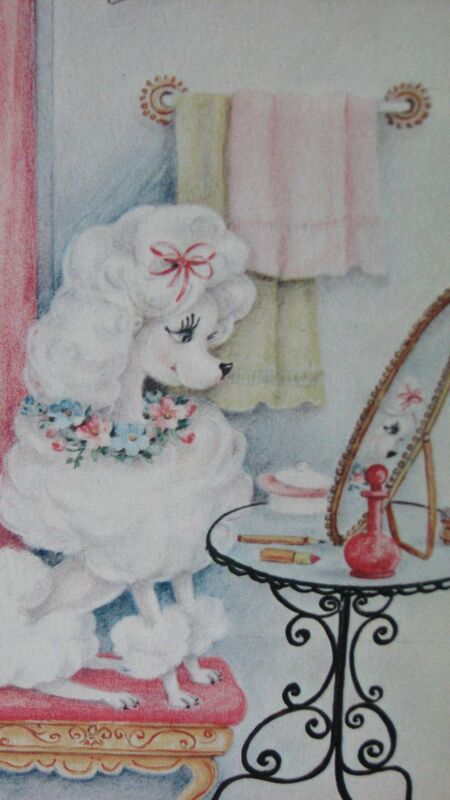 I spotted this POODLE immediately. 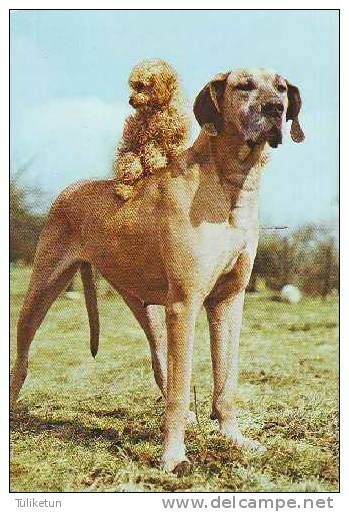 Now you may not think it is a poodle. Brian did not initially. Madeleine doubted for a moment or two. 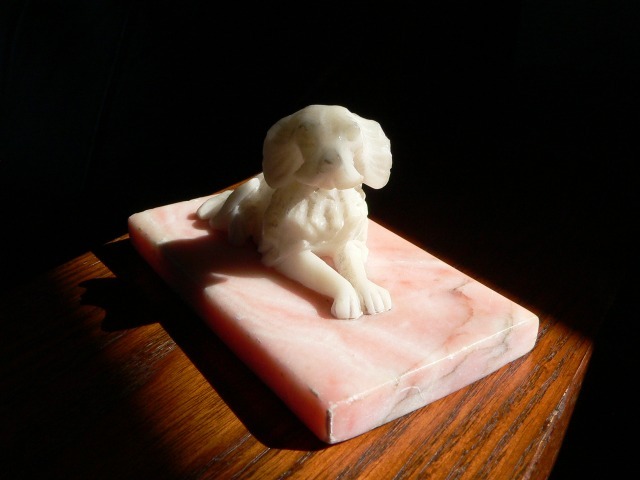 It was labelled as an alabaster and marble spaniel, but people, I ask you. Do I know poodles? Yes. Yes, I do. I checked on the internet when we got home and it is a poodle and worth more than double than what we paid. 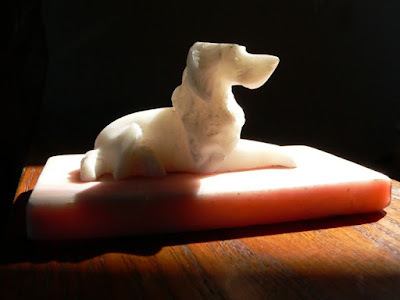 And I do not see any with a pink marble base anywhere. tee hee!! Mine! Mine! Love! I have finished reading Jane and the Ghosts of Netley by Stephanie Barron. This one left me stunned. I am not saying more, in case some of you decide to read these Jane Austen mysteries. I really like all of these Jane novels by Stephanie. 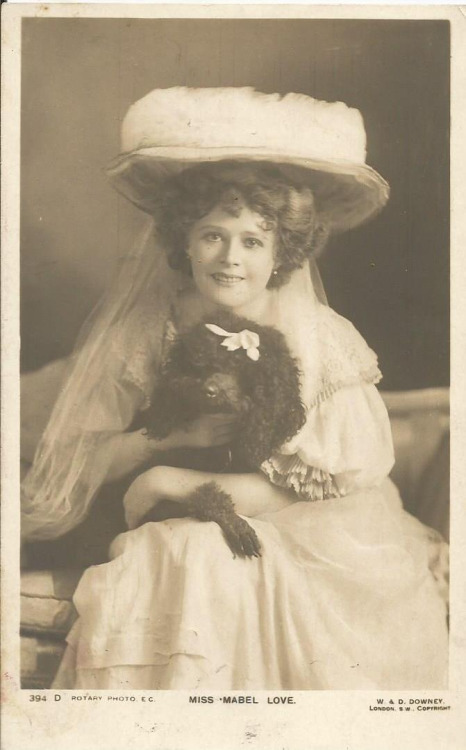 The storylines are based on the actual events in Jane's life. I only find myself wanting to shove her into romance that is not going to happen as we know. 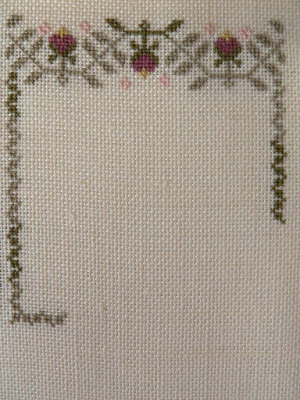 :( You can read more about Stephanie and her techniques to creating "Jane" HERE. Thank you for stopping by today my friends. YOU are a blessing in my life! I hope you have a super week! Hi friends! I have worked all week on the Bonus Chart and have completed it. You will notice I have replaced the center with the Jesus Prayer, instead of the alphabet and numbers that were charted. I also added a cross at the bottom. I made two color changes to match the pattern photo better. 642 instead of 3011 and 3740 instead of 3781. I am now stitching on Forever Be My Always by Emma Congdon again. I read another book by Jacqueline Winspear two weeks ago. This one is NOT one from the Maisie Dobbs series. It is a FANTASTIC book! I loved it! The Care and Management of Lies: A Novel of the Great War was such a good read and not what I expected. Hi friends! 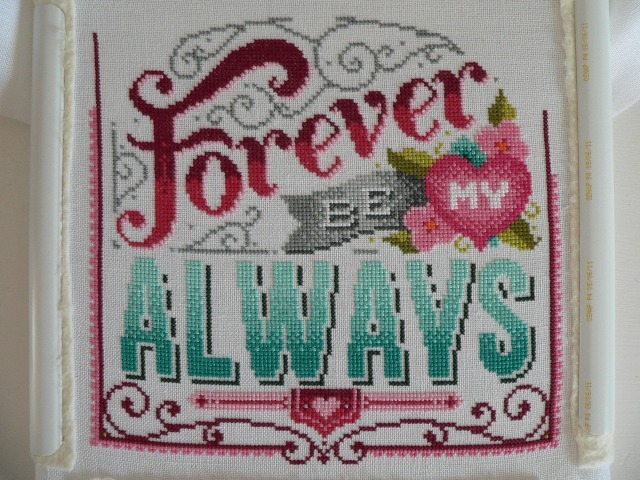 I have been stitching on the Bonus Chart for AotH this week. This is how far I have gotten. I am not going to stitch the alphabet and numbers as charted. 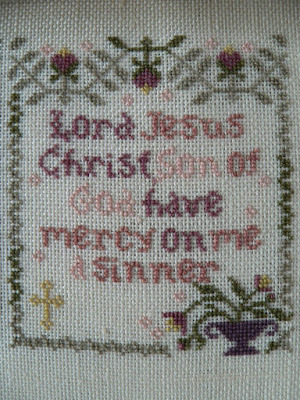 I charted out the Jesus Prayer and will stitch that in after I have worked the border. If you are not familiar with the Jesus Prayer and would like to know more you can CLICK HERE. I have a cold with a nasty cough. It just won't go away. I cough so much that by the end of each day the headaches go up. 🙁 By the way, since the Botox injections the headaches are reduced. They are milder, but still there every day. The problem is that I have a second kind of headache also. Menstrual migraines.😱 Not good. Not good at all. Pain. For one week before my periods begin, it is like a man is pressing his thumbs into my eyeballs nonstop. The doctor gave me a prescription for it. Nope. Does not work. So I have another prescription to try next time. I am hoping! I am hoping YOU have a great weekend! I am so glad you came by to say hi.